Okay! Musume Time: Updates in Life: My Sister's Wedding! My oldest sister married her fiancé, whom she has been with for 16 years. This is the first wedding to happen within my immediate family, though we were never sure if it would happen at all! As I watched my sister with her new husband, it was weird to realise that, indeed, she was married now... it's been so long, and she's rather fickle sometimes that I thought it might not happen. In the end it did, and though we ran into a lot of problems, from DJ's cancelling without telling us, cars not working for the day or dresses breaking at the very last minute... the wedding went on, and now my sister has finally married the man she loves, and hopefully spends the rest of her days happy and content! Honestly though, I never thought any of my siblings would marry... at least, not whilst I'm at this age! 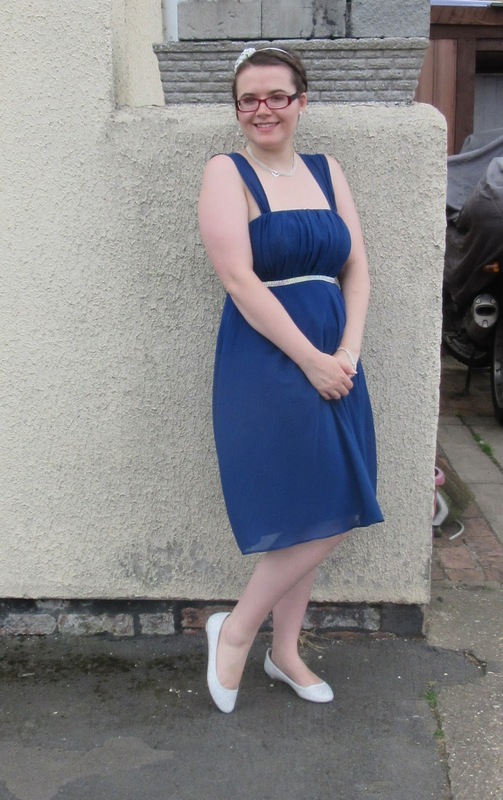 I was a bridesmaid, by the way - as was my younger sister, my oldest niece (the bride's daughter), and my youngest niece, and also my brother-in-laws niece, too. It's weird, calling him my brother-in-law, also, I think I'm too old to be a bridesmaid! That said, despite how much of a pain in the neck this wedding was, from planning to getting ready, I am happy it happened. My sister got married and she's ecstatic to be a bride, and I am really happy that she is happy. In life, we have lots of ups and downs, my sister included, and she does deserve happiness to the fullest, and on this day, though she was stressed and worried and panicking, as you do on the day of your wedding, she came out of it smiling and laughing and almost crying from joy. It was wonderful to see her so cheerful, and yeah, she deserved every ounce of a wonderful day. Aside from my sisters wedding (and the stress of it all, xD), my brother and his girlfriend are now engaged! Their engagement happened a few days before my oldest sisters wedding, but yes, now I have a newly engaged sibling, though I don't think they'll marry too quickly. It's nice to see this brother of mine settling down though, because I doubted it would happen... Me and my doubts, aye? I have many of them! Seriously though, I'm glad to see my brother engaged. His fiancée is lovely, plus her parents own a sweet shop here, so... bonus!!! Also, next month I will be returning to University, though I'll be moving in earlier than the date I start my course again as I will be looking for a job there. It will honestly be nice to live somewhere where I have some form of peace, but also, it'll be nice to get back to my education! I can't wait honestly, because no matter how stressful or annoying University can be, I know I'll have fun! Plus, I get to see my friends again, and this year in Film, I get to study the business side of Disney!!! Sounds awesome, right? No, Chiima, no it does not! Well, to me it sounds fun! Anywhoo, those are the updates I have for you all right now! I apologise for not updating more frequently with reviews or anything like that, but I have recently been reading a lot, and fretting for this wedding that has just passed! Now though, I hope to relax a little, and maybe get some posts done? Well, we can wish for that, at least! I hope life is going well for everyone, but until next time I shall say Ja ne, Ta ta and Bye bye! I love you all and hope that you are having a fulfilling and enjoyable week! I have five siblings! Two older brothers, two older sisters, and a younger sister! A big family, haha! Thank you very much! It's a happy occasion, though admittedly, my parents aren't the sort to care for weddings! And I will do, it'll be stressful but worthwhile for me! And I like to try and bring these kinds of posts sometimes, I like the idea of that personal touch a little!